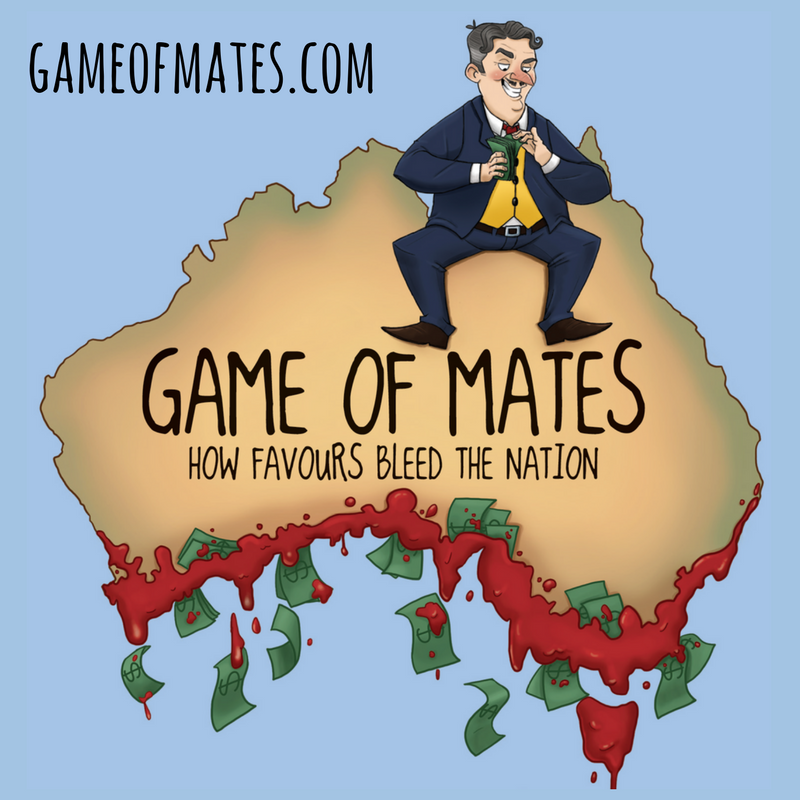 Let's bet on when the consortium entering a deal to build a new casino in Brisbane will go bust. I will bet straight after the company has paid their well-connected senior staff handsome bonuses, and right before being bailed out (probably implicitly) by the Queensland government. As the project progresses the government will bail out the consortium either voluntarily, because the Ministers and staff involved want to build trust with the consortium, or under duress, because the consortium is going bankrupt with a half-finished major project in the CBD. The bailout could be in the form of cash payments. But it could also be hidden in the form of an amended scope of works. Promised investment in new public spaces around the casino will mysteriously shrink as the consortium pleas that these were never part of the deal to be delivered by them. 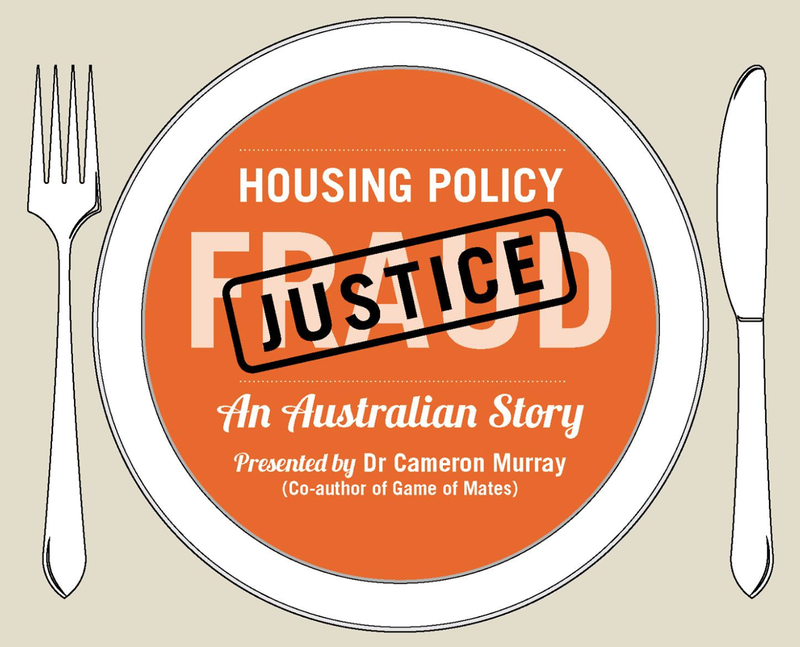 The government will be on the hook for hundreds of millions of dollars right at a time when the budget will be drying up from the downturn of the resources and property boom. I make this bet because I have looked that the fancy images produced to sell the project to the public, and drawing on my experience in costing large construction projects, I can assure you that adding the costs of all the public works in these images cannot be justified by the casino and hotel returns alone. It just doesn't stack up. Public-private partnerships. Notice they didn't say those words explicitly. Because they are dirty words these days as we have come to realise that the public sector simply does not have the skills or the courage to be an equal partner. Such partnerships these days mean that all risk passes to the State while all benefits flow to the private sector partner. I remember sitting in a meeting with Queensland Treasury in 2009 where they were trying to get rid of these arrangements from government because they always end up tilting risk towards the government and benefits towards the private sector partners. But no worries. Happy to do it for a casino. 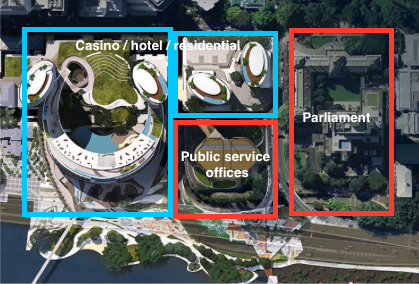 If you look at the picture below it’s almost like the government wants to get a casino as close as possible to their offices; to align themselves through proximity to the interests of the casino owners. I can’t think of a better way to hand money from the public to selected rich, politically-connected casino owners than this. For those still thinking about all the external benefits from a new casino (which is adjacent to an existing casino mind you) maybe think a little harder about the international market for high-rollers. You’ve got all of Asia to choose from. The major cities of the world. Will Brisbane now all of a sudden pop onto your radar because there is a new casino next door to the old one? A very marginal proposition at best. Crucially, watch as the funding mechanism to capture the value uplift on the site is ignored. Gains in land value will be given away to the consortium from the inevitable government investment in public spaces and access to the area. Infrastructure delivered in the PDA shall generally be funded from infrastructure charges levied on development within the PDA. Infrastructure charges will be based on Brisbane City Council's applicable infrastructure charging document for the area or an Infrastructure Agreement. Infrastructure delivered as part of the development may be eligible for an offset against the infrastructure charges that would otherwise apply. The last point here is important. What it means in practice is that there is plenty of scope to negotiate that publicly accessible spaces in the casino area count towards public infrastructure, and that these might even be used to offset the standard infrastructure charge obligations under the Brisbane City Council’s plan. We have seen wiggle room like this used successfully before to get out of obligations to contribute to the public realm, with private driveways and car parks being counted as public space contributions in complete contradiction to the planning intention of these requirements. Essentially, the government is walking into a deal taking on a huge amount of downside risk and absolutely none of the upside. It is guaranteeing profits to wealthy casino owners in a way that is primarily a transfer to them from the rest of society. This is at a time when government revenues will begin falling, and when the city is already committing to costly projects with little to no return, such as the Kingsford Smith Drive project, where costs are likely to exceed benefits by about $200million. But it remains possible that when the reality of the construction costs becomes apparent, the whole project might simply be canned come late 2016. I have no problem with government investing in public infrastructure and improvements in general, but not with the obvious intention of benefiting a select few at a cost to the rest of us. There are so many public projects out there with high benefit cost ratios waiting to be built in the city, from rail, cycle, pedestrian upgrades to improve connectivity, to the basics like stormwater and flood prevention upgrades, and so forth. Read all about the agreement here. It's more comfortable to play online http://onlinecasinoguide.co.nz/ and do not build casino resorts.